Vantage Mobility International recognizes the unique needs of each disabled individual, and VMI knows that it sometimes takes an advanced handicap seat for a wheelchair accessible van to meet those needs. 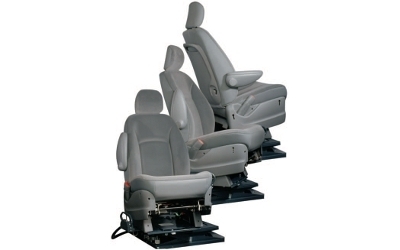 The Ricon Power Transfer Seat for mobility vans swivels 90 degrees with the touch of a button. This turning action makes it simple and safe to transfer from a wheelchair into the passenger or driver seat. Six way operation means making adjustments up, down, forward, back, and rotating left and right. The Ricon Power Transfer Seat is unmatched in its disability access.